There's yet another Hackathon coming up! Yes, this time it is at University of Reading - R. U. Hacking? R. U. Hacking? and RUCES presents their first 24-hour hackathon at Reading University! Whether you know how to code or not, you are welcome to join us in this fun and collaborative competitive programming event! And best of all - it's all free! Make sure you get your tickets to the event at EventBrite. This hackathon is organised by the student-led R. U. Hacking? society here at the University of Reading in association with the lovely people over at RUCES (Reading Computing & Engineering Society). 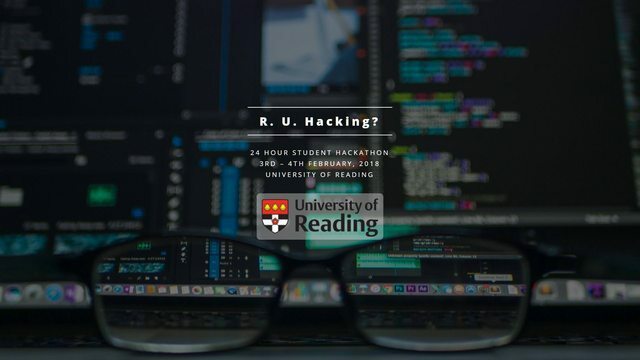 Spring 2018 will be the first 24 hour hackathon organised at Reading University, with prior 6 hour taster sessions running over the past two years. The hackathon will run across the weekend which offers students the chance to split into groups, brainstorm project ideas, and create a working prototype before the time limit is up! On Sunday afternoon teams will present their work and prizes will be awarded based on the committee's decisions. Whether it's your first hackathon, or your 50th, we'd love to see students of all skill levels and from all universities come along for a weekend of creativity, collaboration and code. As BrumHack best describes it, it's an "invention marathon". Amongst the computing community, to hack is to build in as short a time as possible with no thought given to long-term maintenance, simply to demonstrate an idea or play around with a new technology. Whether you're a grizzled veteran in coding or just a beginner, all you'll need at the event is an attitude to get things done. It is a Hackathon so any tech you wish to use in your development go without saying. Oh, a sleeping bag and a pillow also help if you're planning on sleeping during the event! There will be plenty of people to network with during the event, so you can arrange a team up to 4 people before or during the event! Situated at the heart of Thames Valley, the University of Reading has close ties to industry thanks to it being close to the M4. This is known as the “Silicon Valley” of the UK due to the vast number of technology companies that have setup their headquarters here. The University is very invested in innovation, homing the Thames Valley Science Park, home to Reading Enterprise Centre and the Science & Technology Centre. Thanks to our amazing sponsors, students don't have to spend anything to attend! Better yet, some of the companies will be attending the event offering help, hosting workshops and potentially recruiting for their various internship and graduate roles! ...and more! R. U. Hacking? and RUCES are working hard to secure even more sponsors to make this event amazing! Sorry Ryan, we’ve not been as active on this account as we’d have hoped and I don’t have access to the emails. If you’d like to DM us here we can answer your questions? But still, don't worry, we have our live tweet deck! Check out DevPost for the submissions.